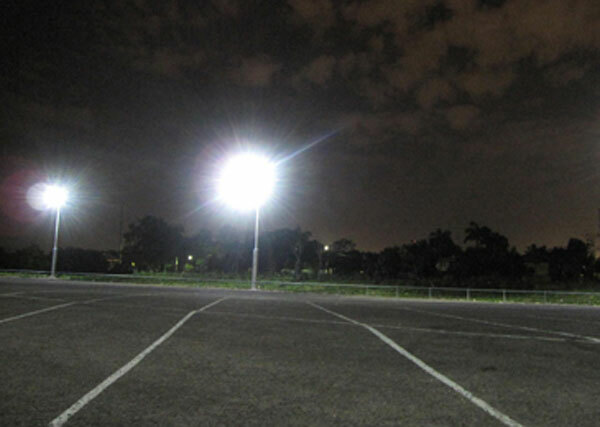 The Vertex™ solar lights at the James Cook University car park emerged from Yasi unscathed, and as a result took many by surprise. While Townsville and surrounding districts sat in darkness, the wind and rain relentless, a glow of distant light signaled the likelihood of workers conducting repairs under lighting generators, however a staff member of James Cook University on final approach discovered the light was in fact the recently installed solar lights at the Cook University car park and the only light to be seen in the entire region at that time. No damage to the solar installation was recorded, in fact the solar photovoltaic panels had not moved from their purposely installed brackets maintaining correct angle and direction, a well earned endorsement to allay all questions regarding the engineering capabilities of outdoor solar lighting installations and cyclones. Yasi was a first for the Cree LEDway® light heads, and a first for the installation contractor Judge Bros Electrical Contractors who see the value of utilising proven and reputable brands of solar lighting. This was a great test for the engineering capabilities of solar installations, particularly those in those coastal areas more prone to gales and cyclones.